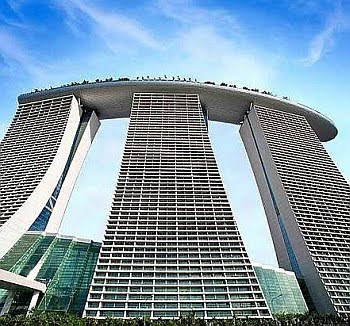 The Marina Bays Sands integrated resort represents a new icon for Singapore. Throngs of locals as well as foreigners have been heading towards the hotel since its opening two months ago. The resort’s owners are hopeful that Marina Bays Sands will be a hit in the region for classy entertainment. As for the Singapore government, it hopes to change the city-state’s rigid lifestlye image to that of a hip tourist destination. There is a lot at stake here. The Singapore government has been striving to keep the country’s economy vibrant. The economic journey from an that of original equipment manufacturing base and financial centre to leisure industry hub has been fraught with risks and challenges. The government has made a huge bet by allowing casinos to operate in the Lion City. Entertainment and gaming chain Las Vegas Sands Corp, which competed with 19 other operators in the 2004 bid for the right to develop two integrated resorts in Singapore, had to navigate through many regulatory hurdles. For example, the government had imposed regulations that the casino should not be the centre of the establishment nor should it take up too much floor space. The Casino Regulatory Authority was formed to handle all dealings with casinos. A daily entry levy of S$100 is imposed on all citizens and permanent residents. Together with the Sands, the government had also imposed a casino exclusion programme to stop people with gaming-related problems from entering. The Sands reciprocated by allocating 3% of floor space to gaming activities in its vast 51-acre resort. It proposed to build an integrated resort with features such as a world-class shopping centre, an international theatre and concert hall, museums and world class dining. The 1.3 million sq ft of MICE (meeting, incentives, conference and exhibition) facilities are also meant to meet Singapore’s requirements. Sands chairman and chief executive officer Sheldon G. Adelson, in an interview with StarBizWeek, says South Asia is a perfect place for an integrated resort, and Singapore is the most suitable spot to expand Sands’ business. “The Asian people have a high propensity to gamble,” he notes. He knows this well, having directly participated in Macau’s booming gaming and entertainment industry. Through its majority-owned subsidiary Sands China Ltd, the company owns a collection of properties in Macau, including The Venetian Macao, Four Seasons Hotel Macao and the Four Seasons-branded serviced apartments at its Cotai Strip development, as well as the Sands Macao on the Macau peninsula. The company is currently constructing a 6,400-room complex at the Cotai Strip, which will feature the Shangri-La, Traders, Sheraton, and St Regis hotel brands. Adelson adds that Singapore is an ideal city-state to invest in because Singapore is known internationally as a clean government. Getting a gaming licence in Singapore is the toughest regulatory process he had ever gone through, Adelson says. “They do a complete background check on you. It is not easy. Many people like to keep themselves private. But what is good when dealing with Singapore is that everything is transparent. They want to succeed. I want to succeed. And they will help me succeed,” he says. In order to win the bid, Adelson appointed world-renowned architect Moshe Safdie to design the Marina Bay Sands on a 15.4 ha site. It was built at a total cost of US$5.7bil. The complex comprises a 2,560-room hotel in three towers and a skypark spanning 107,000 sq ft that connects the towers ot the top. The skypark, replicating a sea vessel, accommodates a public observatory deck, jogging paths, gardens, restaurants, lounges, and an infinity pool. “We are builders of an integrated resort. We are not just into casino ownership. It will be a benchmark for future entertainment sites internationally. I am open to new partnerships anywhere in the world that want to boost tourism as long as there are clear guidelines and transparency,” stresses Adelson. But it remains to be seen if Singapore has made the right step in allowing the gaming industry to set up shop in the country. The numbers show that visitor traffic has stepped up since the Marina Bay Sands opening, with 500,000 visitors each month in the last two months. But can the numbers hold, especially taking into consideration that the Sands opened during the summer holidays, and that the target markets of Indonesia and Malaysia do find the currency exchange rates with the Singapore dollar daunting. REBUILDING a city to make it relevant for the present generation of city folks will not be an easy task as it involves many stakeholders including land and asset owners, the common folks, and the authorities. Despite its daunting task, the effort will be worth it if things turn out well and the people gets a new city after the construction dust settles down. Land and building owners have to be duly compensated before they will agree to move away or give up their asset for redevelopment. There are also the existing physical limitations such as buildings, roads and highways that will have to be considered. Most old cities started out from organic growth and were built on an ad-hoc basis out of the needs of those early years. As with all things, cities also age and decay and some turn into slums. With time, the people’s needs change and cities have to be revitalised and added with new facilities and features to stay relevant . Not many cities will get the chance to be redeveloped unless the initiative has the unwavering support from the government, the people, and other stakeholders, especially the asset and landowners. So, when the government recently announced that a number of the federal assets in Kuala Lumpur and other parts of the Klang Valley would be redeveloped, many feel that this is a chance of a lifetime to “right some of the wrongs” or shortcomings that have been plaguing our cities. It is an opportunity to redesign and rebuild , albeit on a small scale. The “hard to come by” opportunity should not be wasted and should be given much thought and a cohesive master planning to derive the most optimum result. With most of the sizeable land in the city already snapped up and privately owned, the opening up of these prime government assets for redevelopment should be treated with utmost reverence to ensure they will offer real value to the people. The redevelopment initiatives should not be driven just by profit, but should strive to meet other more holistic social, environment and other non-tangible objectives to improve the people’s quality of life and overall wellbeing. It is a good opportunity for the government to leave behind some memorable legacies for the people. Highest on the list is of course the long overdue overhauling of the public transport system to make it highly efficient and well integrated. It should service the length and breadth of the Klang Valley cities to make it one of the most well utilised and successful public facility. Kuala Lumpur’s population has grown to more than two million people and the number is increasing by the day. On top of that, there are close to one million foreign workers in the city. No wonder the city’s infrastructure and facilities including roads, public transport system and open spaces are bursting at their seams. There are also other shortcomings that need to be addressed. In many parts of the Klang Valley, there is a serious over-built and congestion situation. It is time to de-congest and ease up the environment with lower density projects. In view of the glut in the high-rise residential and commercial property sector, developers should plan for more quality low-density developments to raise the quality of the living and working environment. There are already too many unoccupied apartments and condominiums, from the low-cost range to the very high-end ones in many parts of Kuala Lumpur and the Klang Valley. Instead of aggravating the over-supply situation, more low-density residences including townhouses and commercial projects can be planned in those new areas, including the new proposed Sungei Buloh township on the 1,200 ha Rubber Research Institute land. It will be a great if the redevelopment plans incorporate more green and environment-friendly themes with “carbon free” structures and buildings to contribute towards lessening the world’s carbon footprint. Meanwhile, buildings with heritage value should be restored and protected to ensure the country’s rich history and culture is preserved for the future generations. Deputy news editor Angie Ng hopes our city authorities will embrace more balanced development models that promote higher quality of life for the people. For many, “Putrajaya” is often associated with the “Federal Government.” And it’s not difficult to see why. One just have to drive through Putrajaya Boulevard, a stretch of road flanked by formidable, uniquely designed Government buildings with the word “Ministry” on nearly every one of them. Putrajaya Holdings Sdn Bhd (PJH) chief executive officer Datuk Azlan Abdul Karim is the first to point out the Putrajaya/Government co-relation. “When we built Putrajaya, we didn’t design it solely for the public sector. It’s for the entire nation. You can’t have a liveable city if it’s only catered to one particular sector,” he tells StarBizWeek. PJH is the administrative capital’s master developer. Azlan admits there is a need for developments in Putrajaya that could “attract the people,” namely via commercial projects. “People don’t consider Putrajaya as a business hub, again because of the feel that the place is exclusive to government personnel,” says Azlan. Azlan says PJH has sold three parcels of land to two Hong Kong-based parties for potential commercial developments, but declines to go into detail. He also says PJH is looking into the possibility of setting up a theme park within Putrajaya. “We’ve been having discussions with several parties, especially international players. But nothing is concrete at this moment. We are embarking on several ‘unique’ projects to bring in the crowd,” he says. It currently has one retail centre – the Alamanda Shopping Centre in Precint 1. In May, PHJ launched its Venice-inspired commercial development, the Promenade@8 in Putrajaya. The freehold development is the first waterfront development in Putrajaya. It comprises shopping lots, outdoor dining and leisure areas. Heralded as the “waterfront hub for business and leisure,” the project bosts a nett saleable area of 240,000 sq ft, with a gross development value of about RM120mil. Azlan says that about 90% of the units had already been taken up. The project is slated for completion within the next three years. Azlan says that PJH plans to offer office suites in Putrajaya within the next year and a half. “We want to target entrepreneurs to both live and work here. We have also awarded a contract for a 380-room business hotel about three months ago,” he says, without disclosing further details. Azlan also says there was a need for more entertainment outlets in Putrajaya. According to previous reports, PJH has a total undeveloped landbank of 801 acres, with 385 acres allocated for commercial development, while the remaining 416 acres have been earmarked for residential development. Azlan says there are about 1,800 “affordable homes” in Putrajaya already, adding that there were plans to launch more of these developments in the pipeline. “The people living here complain that our residential developments don’t have fences (between the homes). But this is intentional, as we feel it would foster better interaction between the residents,” he adds. According to Azlan, Putrajaya has about 80,000 residents. Its working population is around 35,000. Under the 10th Malaysia Plan, The Government announced it would promote environmentally-friendly housing by introducing guidelines and a green rating system. Putrajaya and Cyberjaya would serve as flagship green townships. He says future projects would need to comply with the Green Building Index (GBI). “This is to ensure that our buildings are energy efficient. The Government is also providing incentives to developers that construct buildings that are GBI-compliant. “With the incentives, we’re hoping that more developers would come in and take up the challenge (of developing green buildings). Azlan adds that developers should not be influenced by incentives to develop green buildings. “It should not be about that (incentives). (Going green) means to be sustainable, which is necessary for our future development. In some countries today, construction projects are not even approved if they don’t meet certain (green) requirements. PETALINGJAYA: Putrajaya Perdana Bhd was awarded a contract worth RM321.5mil by The Intermark Sdn Bhd to complete a hotel and commercial redevelopment project in Kuala Lumpur. “The contract period for the project is 23 months, that is to commence on July 14 and to complete by June 15, 2012,” the company told Bursa Malaysia yesterday. It said the project was expected to contribute positively to the earnings and net assets of the group for the financial years ending Dec 31, 2010 to 2012. With over 330 exhibitors, the 11th Malaysia Architecture, Interior Design and Building Exhibition (Archidex 2010) is not to be missed — at least not by architects, interior designers, developers, quantity surveyors, engineers and other professionals in the building industry from the region. The ongoing exhibition at the Kuala Lumpur Convention Centre in KL ends tomorrow. The annual event is jointly organised by the Malaysian Institute of Architects (Pertubuhan Arkitek Malaysia/PAM) and C.I.S Network Sdn Bhd, in conjunction with the PAM 2010 Convention and the Inaugural Asean Architect Congress. The exhibition this year features 838 booths occupying five exhibition halls with more than 330 companies from eight countries — Austria, China, Singapore, Australia, Germany, Korea, Thailand and Malaysia. According to C.I.S Network Sdn Bhd president Vincent Lim, there is an increase of six percent in exhibition space and a 10% increase in exhibitors at this year’s Archidex. In his welcome address, PAM president Boon Che Wee said design and green are the two fundamental and crucial differentiating factors in enhancing global competitiveness. “We have encouraged the government to first adopt a visionary, defining and all-embracing Malaysian Architectural Policy or MAP as a commitment of the government to architecture of excellence, and as a role model to the private sector. “We urge the government to lead by providing more opportunities for the discovery of Malaysian architects through open competitions, for all projects of national and public interest, starting with projects by government agencies and government-linked companies, to set an example to the private sector,” he said. This year, there is a green hall, which is introduced exclusively for exhibitors to exhibit environmental, green building technologies, and green-related products. Edward Loy, the managing director (Malaysia, Singapore and Indonesia) of Saint-Gobain Construction Products (M) Sdn Bhd, said since the introduction of the Green Building Index (GBI), many deve lopers are looking into going green. “Our objective at this exhibition is to raise our profile and encourage architects and developers to go for green products for sustainable development,” he said. Established in 1665, the company ventured to Malaysia in 2006. Its headquarters is in Paris. Loy believes they are the first company in Malaysia to collect and recycle their materials. “We collect leftovers and unused materials from our clients’ construction site and recycle it,” he said. He added that their product, the ThermaLine, reduces heat transfers and prevents cool air from the air conditioner from escaping. “Hence, you save on electricity bills,” he said. At the Nippon Paint booth, there is a range of eco-friendly paints available. “The exhibition is good for brand exposure, there has been quite a good response from the visitors, mostly developers, who were looking for green paint,” Nippon Paint (M) Sdn Bhd senior marketing executive Audrey Tan Khang Yee said. This is the second time De Sofa Manufacturing Sdn Bhd director Eric Lee Chin Foong is taking part in the exhibition as he feels that it provides good exposure for his company and products. “The exhibition is a good opportunity to gather all the professionals (in the industry) to share the latest trends and market information,” he said.